Tire Registration Plus is the industry's leading digital tire registration and recall management solution. Our software makes the process of compliance quick and easy. 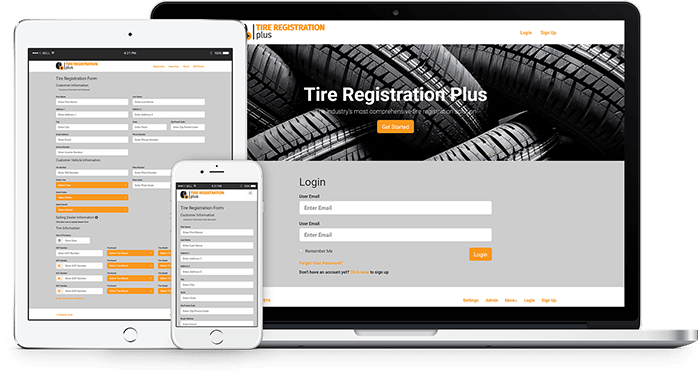 Our all-brand tire registration form eliminates the need to visit dozens of tire manufacturer websites. Register tires digitally and securely transmit them to the appropriate tire manufacturer. Search for tire recalls by a variety of fields and get detailed recall information directly from NHTSA. Know instantly if you have customers affected by a recall. Quickly and easily retrieve your registration records and get vital customer and tire information related to recalls. Keep track of the replacement status. Keep the customer in your shop and away from the competition. Never service an aged or recalled tire again. Use our quick DOT check feature to check every tire that comes through your shop. Get instant feedback on the age of the tire and recall status. Tiremetrix provided the perfect solution to manage Belle Tire’s compliance requirements for all-brand tire registration. Their software integration was easy and affordable. We can even check every tire for outstanding recalls during the sales and service process, ensuring an additional level of safety for our business and our customers. Get instant access to our web application and begin registering immediately. Tire Registration Plus is directly integrated with point-of-sale (POS) software providers, giving dealers an easy and convenient way to register tires without interrupting their workflow. Don't see your POS software provider listed? Reach out and let them know you are interested in Tire Registration Plus.